We supply laminating pouches for all brands of pouch laminators. Laminating pouches are made of high quality heat activated film to preserve and product your printed documents, giving them an unsurpassed professional appearance. 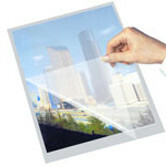 Laminating your documents will enhance their colors while preserving them from the elements and general wear and tear. A laminating pouch can be used to laminate credit cards, business cards, drivers license, luggage tags, photographs, menu, and much more. Each laminating pouch will provide superior clarity and a quality adhesion. They can be used with most pouch laminators. Be sure to purchase the correct thickness for your particular laminator. All the pouch sizes that we offer can be provided with a slot for a strap at a small additional charge. We also offer custom sizes as well as custom imprinting, magnetic strips, colored backs, and many other custom features. Most laminating pouches are available from 3 mil up to 10 mil. Review the available laminating pouch sizes, including thicknesses, applicable for your final end use. We guarantee that you won't be disappointed! Advanced Document Systems and Supply also offers a wide selection of pouch laminators to help you with all your laminating projects. We carry machines such as the PH 900 Pouch Laminator that can handle all types of paper, photos, and digital prints, and can laminate documents up to 10-mil thick and up to 9 inches wide either as a hot or cold laminator. For wider projects, the SM-330 13 Pouch Laminator is an affordable photo pouch laminator with advanced heated roller design. It laminates pouches from 3 mil to 10 mil easily with professional results. Please feel free to browse our complete catalog of pouch laminators and the handy pouch laminating machines comparison chart we have prepared. We also invite you to review the online selection of single sided laminating machines, photo ID laminating machines, wide format laminating machines, and roll laminators.